This species is native to Honshu Island, Japan and was first described by Dr. Fumio Maekawa in 1935. It forms a small size mound about 10 inches tall by 30 inches wide and has average substance to the leaves. The leaves are chartreuse green, elliptical and ovate in shape with a sharp point at the tip. It bears white flowers with purple anthers from June into July. 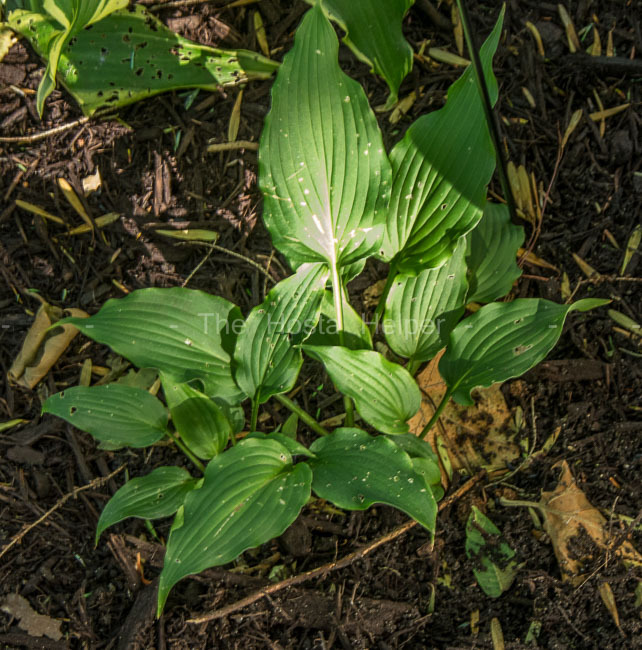 Mark Zilis' Field Guide to Hostas (2014) states that this species was found in Japan in "...in rocks along rivers..."
An article by Hajime Sugata of Japan in The Hosta Journal (1994 Vol. 25 No. 2) states that "The natural habitat of H. kiyosumiensis is similar to that of H. longipes , but, H. kiyosumiensis grows closer to water than H. longipes. It loves wet rocks or water-dripping cliffs along river valleys. Rocky rivers are seen running nearby: Tomoe River in Toyota City and Asuke Town, Kansa River in Shitara Town, and Oto River in Okazaki City and Nukata Town. Those rivers are wide and the woodland reaches to the edge of the rivers; wet rocks, therefore, and cliffs provide an ideal habitat for H. kiyosumiensis. Regionally modified forms are rare, such as a yellow-centered variegated one called 'Busen' and a white-streaked one in upper Oto River. A white-flower one with a green stem (chlorophyll color only) is found."